MMJ publishes original articles on clinical and experimental research related to any area of medicine. Editorials, letter to the editor, review articles, case reports and technical note on clinical observations may also be considered. By submitting a manuscript to this journal, authors accept that their manuscript may be screened for plagiarism against previously published works. Processing and publication are FREE of charge. No fees are requested from the authors at any point throughout the evaluation and publication process. One of the main goals of the journal is to provide global researchers with a free publishing platform. Anyone can use the articles as long as the credit is given to the author and citation to the original source. It is available to reach the articles by search engines, websites, blogs and other digital platforms. The manuscripts are scanned by the Publisher’s Office using the iThenticate program for determination of plagiarism and non-ethical situations. The corresponding author will receive an e-mail that informs the status of the manuscript at any step of reviewing and publishing process. Manuscripts should be written in Turkish or in English. If the manuscript is in Turkish, it must also include English abstract and Keywords. Papers should be typed in 12-point typescript and double-spaced throughout the text including tables and references with wide margins (2.5 cm) on each side of a standard A4 paper. The manuscript should include the following: (i) title page, (ii) abstract, (iii) main text (introduction, materials and methods, results, discussion), (iv) references, (v) figure legends, (vi) tables, (vii) figures. The first page should contain: a title of the paper, running title (not more than 30 characters, including both letters and spaces), author(s) name, department, institution, city and, country. Authors that work different department or center should be indicated by superscript numbers. The title page should carry the name and address of the author to whom correspondence. Telephone number, fax number, and e-mail address should also be given. The corresponding author will receive an e-mail alert containing a link to a website. Therefore, a working e-mail address must be provided for the corresponding author. Abstract word count must be less than 250. Both Turkish and English abstract should be added to the test. For non-Turkish authors, Turkish abstract is not necessary. Abstract should contain: Objective (or Background), Method, Results, and Conclusions in clinical and experimental studies. Give the main results of the study. State the primary conclusions of the study and their clinical implications. Suggest areas for further research, if appropriate. Abbreviations: Abbreviations should be standard. Any nonstandard abbreviations should be defined in the text when first used. Tables and legends: Tables and legends should be typed on separate pages at the end of the manuscript. Any explanation should be defined as a footnote, not in the legend line. All illustrations, artworks and figures should be original. It is the authors’ responsibility to obtain necessary permissions for any material with copyright. Illustrations, figures and graphics should be prepared in tiff format with a minimum resolution of 300 dpi. They should be clear, sharp, easily readable and legible. Illustrations must be cited in consecutive numerical order in the text. The staining method and the magnification rate should be indicated in microscopic illustrations (e.g. H&E, x400). Submitted photographs, figures and graphics should be of professional quality. Legends for the figures should be typed double-spaced on a separate page. They must be concise and represent summaries of findings. Authors should retain one copy of original artwork. Persons who contributed to the reported research, but do not qualify as co-authors, should be listed before the References section. Acknowledgments should include professional affiliations of other contributors, such as persons who provided data analysis, statistics, data collection, technical assistance, or special thanks for personal assistance and dedications. Also sources of funding (e.g., grants and contracts), facilities or materials provided etc. should be listed here. This is to acknowledge any financial interest or benefit that has arisen from the direct applications of your research and should be listed before the References section. Further guidance on what is a conflict of interest and how to disclose it. Ferry DR. ECG in Ten Days [On Günde Temel Elektrokardiyografi]. Kahraman M, translator. Istanbul: Ekbil A.S.; 2001. Tolay E. Planlamanin temelleri. In: Robbins SP, Decenzo DA, Coulter M. editors. Yönetimin Esaslari: Temel Kavramlar ve Uygulamalar. Ögüt A, translator. Ankara: Nobel Akademik Yayincilik; 2013. p. 104-29. Bayram TY. Üniversitelerde örgütsel sessizlik [master’s thesis]. Bolu: Abant Izzet Baysal Üniversitesi, Sosyal Bilimler Enstitüsü; 2010. Our MEDJ is an open access, independent and unbiased international journal published in Turkish, ans English, , based on double-blind refereeing procedures. All articles are reviewed by the editor-in-chief, chapter editor, at least two referees and editor of the statistics department. Double-blind peer- review is a high -quality, objective and ethical method applied to evaluate scientific publications. The authors and institutions of the articles subjected to evaluation are not notified to the reviewers. Likewise, authors do not know the identity of the reviewers who evaluate their works.. The editor –in-chief evaluates the article in accordance with the purpose and scope of the journal, its suitability to the rules of writing, and the adequacy of English and Turkish language. At the conclusion of the review, articles which are not in accordance with the publication rules of the journal and the publishing policy are returned to the author. Plagiarism control is applied to articles that pass this stage. While the articles that are deemed suitable according to the results of the plagiarism report are included in the preliminary evaluation process, the articles which are not approved are returned to the responsible article. During pre-assessment process, the manuscripts that received the favourable opinions of the editor-in-chief, and passed the plagiarism check are referred to the editor of the respective field.editors It is reviewed by field editors in terms of article, scientific suitability to the journal, and sections of the manuscript (abstract, introduction, material / method, results, discussion, conclusion), As a result of this review , the appropriate manuscripts are taken into consideration during the referee evaluation process. According to the contents of the manuscripts, at least two referees whose studies have been published relevant to the field of medicine in question in international indices within the last five years is determined. The referee's recommendations sent from the field editor is evaluated by the editor-in-chief, and referees are assigned to evaluate the manuscripts. The referees evaluate the manuscript in terms of its scientific suitability, purpose, material / method, results and discussion. Proposals for corrections requested by the referees are communicated to the authors and the authors are asked to revise their work. The results of the corrections submitted by the authors are again reviewed by the referees and the editor –in-chief is notified. If one of the two appointed referees express a negative opinion, then the manuscript is sent to a determined third referee for examination. The manuscripts approved by the referees are sent to the editor of the statistics department. The manuscripts that receive the approval of this editor are accepted for publication and passed to the printing phase. Accepted clinical or experimental research articles are generally published in the first issue following their acceptance for publication. Case presentations may be published 6-9 months later dependent on the publication density of incoming manuscripts. Submission is considered on the conditions that papers are previously unpublished, and are not offered simultaneously elsewhere; that authors have read and approved the content, and all authors have also declared all competing interests; and that the work complies with the Ethical Approval and has been conducted under internationally accepted ethical standards. All clinical (both retrospective and prospective) and experimental studies should have ethical committee approval and signed document by the ethical committee should be submitted separately. In the main text, this information should be given in the material and method section without the name of the ethic committee for double blind evaluation. The ethical committee name and number should be added to the article at the final stage before the prescription in accepted clinical and experimental articles. If ethical misconduct is suspected, the Editorial Board will act in accordance with the relevant international rules of publication ethics (i.e., COPE guidelines, https://publicationethics.org/resources/guidelines). Plagiarism programs, such as iThenticate, will be used to detect plagiarism before the reviewer evaluation process. The policy of the journal is respectful of the Human and Animal Rights. If the work involves the use of human or animal subjects, an approval of research protocols by an ethics committee in accordance with international agreements (“WMA Declaration of Helsinki - Ethical Principles for Medical Research Involving Human Subjects, October 2013, Fortaleza, Brazil”, "Guide for the care and use of laboratory animals, 8th edition, 2011" and/or “International Guiding Principles for Biomedical Research Involving Animals, 2012”) is required for all research studies. Authors should include a statement in the manuscript that informed consent was obtained for experimentation with human subjects. The privacy rights of human subjects must always be observed. 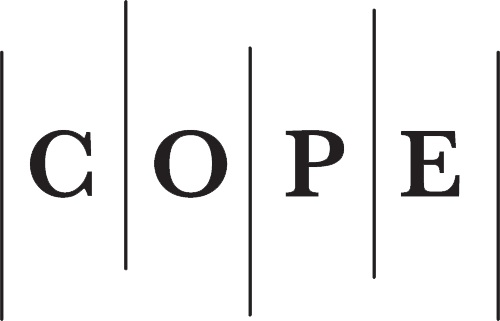 If the submitted manuscript does not include ethics committee approval, it will be reviewed according to COPE's guideline (Guidance for Editors: Research, Audit and Service Evaluations). Authors who will submit their studies to Medeniyet Medical Journal have to fill in the "The Statement of Authorship and Copyright Transfer Form". Wet signature is required. The signed form should be scanned and uploaded during the submission of the manuscript. Those studies whose copyright transfer form is not received by the journal will not be published. All pages (including sources, tables and titles, figure titles, and [if possible] figures) must be saved in a single electronic file. The manuscripts submitted to Medeniyet Medical Journal for publication should possess the characteristic features of an original work , and it must not been previously published in any form or sent for publication at any time. The authors must agree to waive the copyright of their work and transfer it together with the submission of their manuscript for evaluation to the Medeniyet Medical Journal. The Editorial Board is authorized to publish the article. However, the authors reserve their patent rights, all unregistered rights other than copyright, the right to reproduce the article for their own purposes, and use all or part of their article in their own books and other academic works (on condition that they provide references) the right to have it on their personal websites or in the university's open archive provided that they indicate the title of the study. The authors who will send their works to our journal should fill in the "Copyright Transfer Form" , and sign the completed form with a wet signature. The signed form must be scanned and uploaded via the system with the option of uploading additional files during the manuscript submisson steps. At the same time the printed form carrying author’s wet signature must be sent by mail to the following address "LOGOS PUBLISHING, Yıldız Posta Cad. Sinan Apt. No. 36 D. 66/67 Gayrettepe-Istanbul 34349, Turkey" The works of the authors who do not deliver the Copyright Transfer Form to the Logos Publishinmg Co. will not be publish. Medeniyet Medical Journal adopts open access policy and all articles published open access will be immediately and permanently free for everyone to read and download. Anyone can use the articles in any constructive way as long as the credit is given to the author and citation to the original source. No permission is required from the authors or the publishers. It is available to reach the articles in this journal in-between search engines, web sites, blogs and other digital platforms. Medeniyet Medical Journal has adopted an open access policy as a publication organ that is aware of the need to be easily accessible in order to be able to promote scientific researches. When the power of knowledge is considered, open access is of great importance to researchers and readers.. Medeniyet Medical Journal also supports the Budapest Open Access Initiative that was signed on September 12, 2012. Thus, the open access policies adopted by the editorial board of Medeniyet Medical Journal can be found at http://www.budapestopenaccessinitiative.org/boai-10-recommendations. Medeniyet Medical Journal publishes all articles under a Creative Commons Attribution License (Attribution-NonCommercial-NoDerivatives 4.0 International CC BY-NC-ND). This license entitles all parties to copy, share and redistribute all the articles, data sets, figures and supplementary files published in this journal in data mining, search engines, web sites, blogs and other digital platforms under the condition of providing references. Open access is an approach that eases the interdisciplinary communication and encourages cooperation among different disciplines. Medeniyet Medical Journal, therefore, contributes to its own field by providing more access to its articles and a more transparent review process. Medeniyet Medical Journal recommends that libraries include the article contents into library catalogue records. Logos Medical Publishing, publisher of Medeniyet Medical Journal, guarantees that it will not ask for any publication fees from any library or reader to access the electronic articles. No subscription or fee is required from any researcher to access to electronic articles published in our magazine.